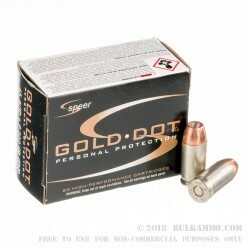 An overwhelming number of police officers exclusively load Speer’s Gold Dot into their service pistols, which is probably the soundest endorsement that a self-defense line of ammunition could hope for. 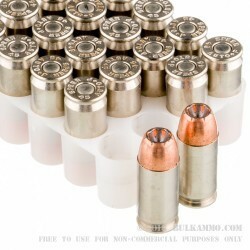 This 45 ACP +P cartridge sports a 200 grain jacketed hollow point bullet. The projectile features a uniformly thick jacket electrochemically bonded to its alloyed lead core, which practically eliminates separation and promotes optimal weight retention during expansion. The round’s nickel plated brass casing provides both smooth functioning and resistance against the elements. Its select propellant delivers a consistent muzzle velocity of 1,080 fps. Finally, its sensitive and reliable CCI Boxer primer ensures a reliable shot with ever pull of the trigger. 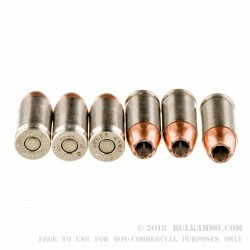 All in all, this is a great round for personal protection, made even sweeter by its full reloadability that will add value to your purchase for a long time into the future. Please note this cartridge’s +P designation, and only load it into firearms that can accommodate it!